How important is testing for your business? Or let's say is testing a necessary step while you are heading towards a successful business? In the recent time, the question is not about how important is testing for us because it has become more crucial than the other processes carried out while we prepare a project. As testing is an important process which assures customer satisfaction and helps you in keeping your app away from bugs, failures, and other possible errors. The whole process of testing involves a huge planning, thorough analysis, understanding the risks and possibilities of errors, and then fixes it completely. With the growing advancements in the testing industry, testing has become more complex and accompanies a lot of challenges too. This might be challenging for the testers. Isn't it? With the growing trends in the machine learning process, testers can smartly benefit from it and make a switch from manual testing models to precision-based testing process. The AI-powered testing framework lets you identify the changed controls more efficiently unlike humans, and observes even the minor changes thoroughly. So, artificial intelligence will transform the testing industry to a certain extent. Want to know more about how artificial intelligence will benefit the testing industry? 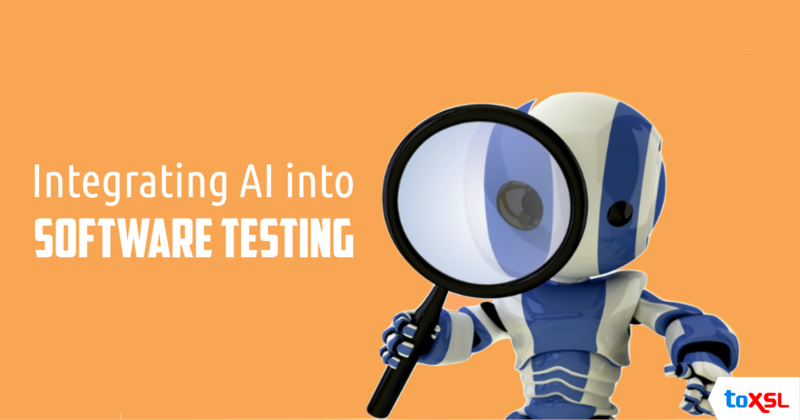 Here is a list of major benefits of introducing AI Into software testing process. Improved Accuracy: Committing mistakes while testing manually is always possible regardless of how experienced your testing team is. Agree? Carrying out AI-based software testing lets you perform automated testing accurately without missing out on recording detailed results. This will further help the testers to have enough time to deal with other sophisticated features. Overcoming the limitations of manual testing: Carrying out testing for a huge website or an app which requires a number of testers will demand a large staff engagement. Isn't it? While on the other hand, carrying out AI-powered testing lets you perform accurate testing in which you can simulate hundreds, or thousands of users interacting with the apps to be tested. Benefits both testers and developers: Shared automated tests can help your developers to identify issues quickly before forwarding it to the testing team. Whenever the source code changes, tests will run automatically and the developers get notified if there are any errors or other bugs. This will directly help in saving the time of both, developers and the testing team. Improving overall test coverage: AI-powered testing lets you execute various different test cases for all the test runs which are simply not possible if we go for the manual testing process. AI-powered testing process will let you perform the testing thoroughly in each of the minor modules and present you the most efficient results. Time & cost-saving solution: Once changes are made in the code, carrying out the testing process repeatedly for every module will not only consume a huge time, rather it will cost you heavily. Carrying out automated tests lets you perform the testing process for any number of times without any costs. How ToXSL Technologies can help you! ToXSL Technologies is one of the most reputed software and app development company which has been successfully delivering the automated testing services to its worldwide clients. We have been offering genuine and superior quality services at the most affordable costs. Want to know more? Get in touch with our expert team and get assistance instantly!